Forget Big-Box Stores. How About A Big-Box House? Using recycled materials is increasingly common in building construction. But some architects are taking the green movement a step further, creating entire homes and businesses from discarded shipping containers. They call it cargotecture. Forget Big-Box Stores. How About A Big-Box House? When it comes to architecture, sustainability and affordability can mean many things: Salvaged wood becomes new flooring, old newspapers are shredded into insulation. But a few architects are taking green building one step further: creating entire homes and businesses out of discarded shipping containers — an approach some have dubbed "cargotecture." Approximately a quarter-million shipping containers pass through Oregon's Port of Portland each year. These are big boxes — 40 feet long and weighing thousands of pounds. "As you look across the container terminal here, they look like giant, multicolored Legos stacked up out there," says port spokesman Josh Thomas. Each one is full of cargo moving in or out of the Portland region. Shipping containers are ubiquitous on trucks, trains and ships today; about 20 million pass through American ports each year. But as critical as they are to modern life, the containers date back fewer than 60 years. "We started to see containerization," the freight shipping system based on the boxy containers, in the 1950s, Thomas says. "And since then, increasingly, just about anything that can be shipped inside of a container is." But traveling so many miles takes its toll, and eventually the containers are retired. Some are melted down, and some sit around old lots. And some become buildings — like taquerias. The southeast Portland restaurant Aprisa Mexican Cuisine is one of them. 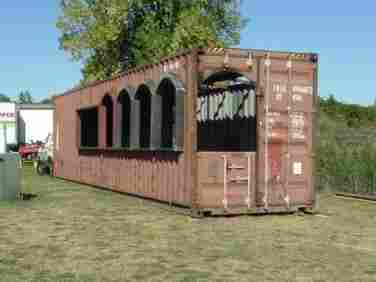 Kirk Lance bought the old container that houses the restaurant for $2,500. He worked with architects and structural engineers to overhaul the steel frame, spray in insulation and cut out windows. "There's no construction methods that are extremely intricate or technical," Lance says. "Other than getting the blueprints permitted through the state of Oregon," he adds. "That was technical. But the construction itself? Fairly simple." 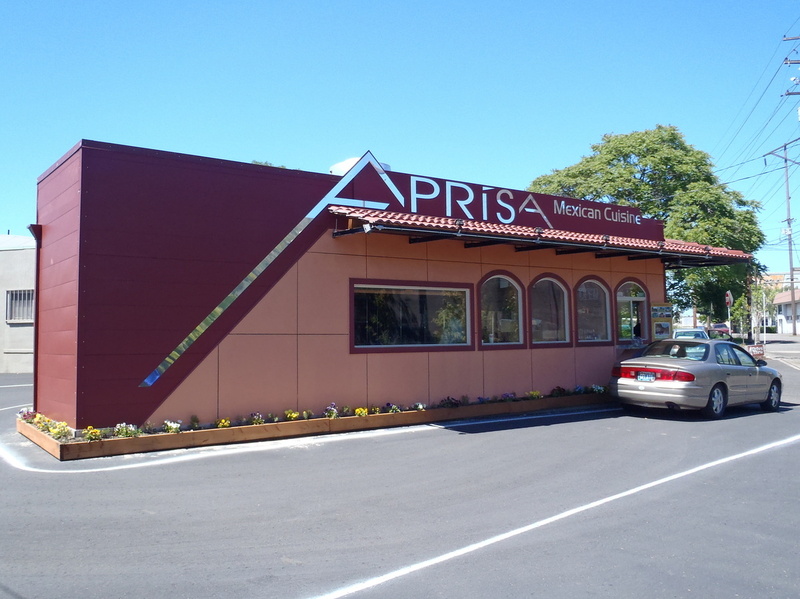 After: The cargo container is now home to Aprisa Mexican Cuisine in Portland, Ore.
A cargo-based business is flexible, as well. It can be hauled to a new location or loaded on a cross-country train to set up a new franchise. But for Lance, cargotecture was about more than just portability. "This thing, it's had a life," Lance says. "It was born somewhere, and it's traveled the world and hauled millions of pounds of who-knows-what. And it ends up as a little restaurant in a street corner in Portland, Ore."
The buildings are popping up elsewhere, as well. Cargotecture designs have been used for student housing in Amsterdam and a pop-up art studio at New York's Whitney Museum. A Seattle firm, HyBrid Architecture, has used shipping containers to build cargotecture one-room cabins and multistory office parks. HyBrid co-founder Robert Humble says the containers pose some specific challenges: They have industrial paints and coatings to deal with, and they're just steel boxes with no real frame. But essentially, he says, it's a building material. "The mechanical equipment, the plumbing, the electrical, is really quite traditional," Humble says. "But it is that wrapping in a container that allows the house to be so portable, so flexible and overtly sustainable on the outside." Like many in the cargotecture movement, HyBrid emphasizes that sustainability in its designs. The company leaves on the original stickers, longshoreman's marks, and all the other little dents and dings that, as Humble describes it, tell people the story of where the containers have been. "They can imagine the container on a ship, they've seen it on a truck, and they kind of take an emotional journey with that container," Humble says. "And finally, it's at rest, and they can live in it." As Nick Radecki and Kelly Cook do. 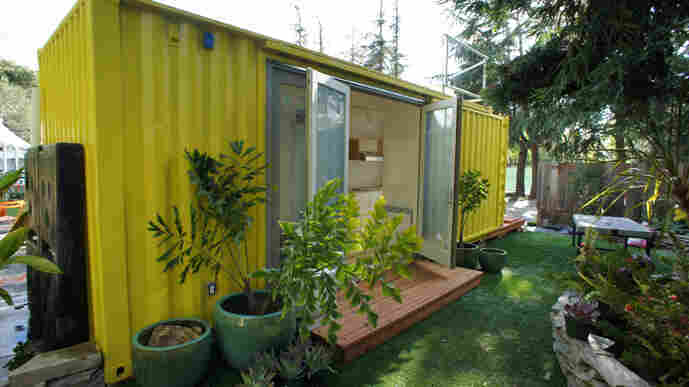 They rent a bright turquoise house made from two welded-together shipping containers in southeast Portland. "It's a big bathtub — shower up in the ceiling, pedestal sink, nice window," Radecki says, showing off the bathroom. "It's better than a lot of apartments." Cook, Radecki's wife, initially took some convincing. And the couple has had to deal with the pros and cons of an open floor plan, as well as curious people who stop in to ask for a tour. But the couple likes that the home is recycled. And ultimately, Radecki says, it's a good house. People often say they want a green house, Radecki says, but "truth be told, the only green home is a well-built home." Although with two young boys, two dogs and a cat, Cook and Radecki both admit it may not be long before they outgrow this particular piece of green cargotecture.